The turkey fryer is not just for Thanksgiving! 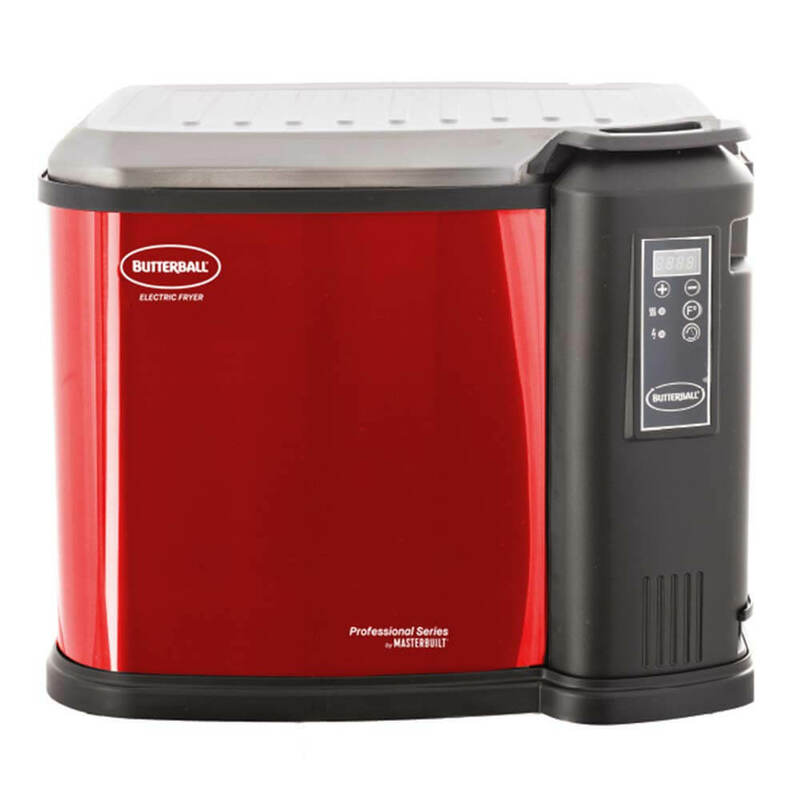 If you regularly want to cook large roasts, or even boil or steam larger quantities of food, then the turkey fryer makes an ideal addition to your kitchen appliances. There are two main types of turkey fryer, a typical outdoor fryer which can be propane or electrical powered, or an indoor electrical fryer. Nowadays there are also oil-less models, which may be designed for indoor or outdoor use and are ideal if you need to cut back on fat. 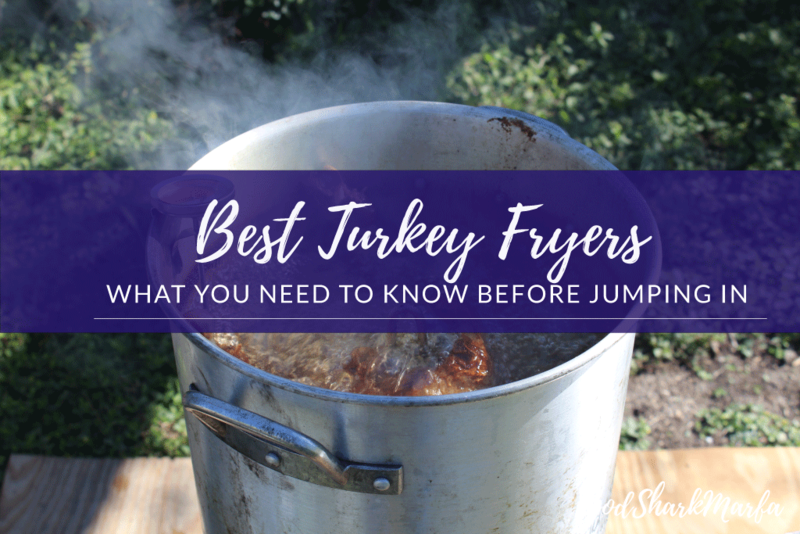 This review not only looks at a range of the best turkey fryer but also looks at the pros and cons of the different types of fryers and offers tips on cooking your turkey safely. For oil free outdoor cooking, the Char-Broil Big Easy turkey fryer is our best pick for being able to cook up a 16lb turkey. 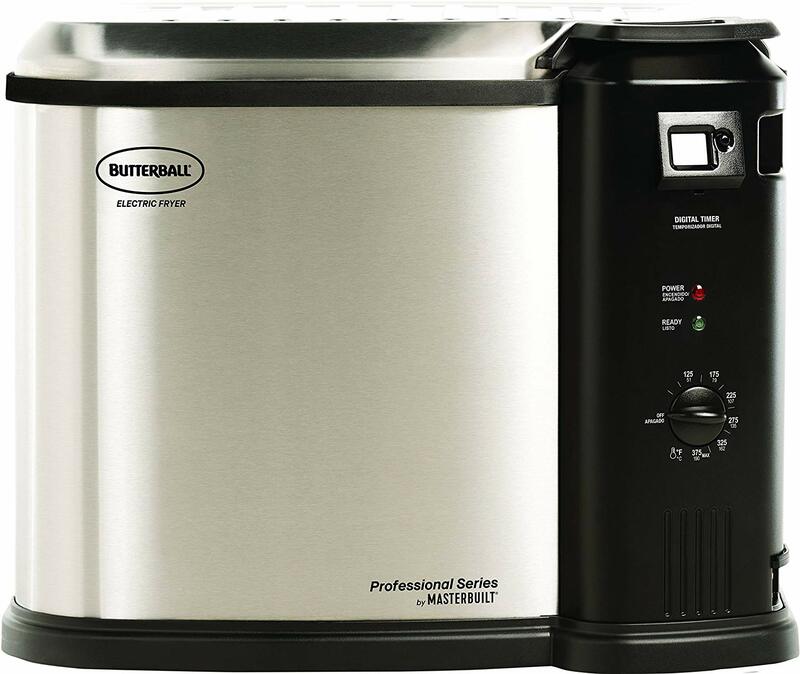 The Masterbuilt Butterball XL electric turkey fryer is our indoor budget pick for its ability to not just fry XL turkeys, but to also boil or steam. The Char-Broil Big Easy turkey fryer uses infrared heat to cook turkey and other cuts of meat such as pork tenderloin and bone-in or boneless ribs. The 16,000 BTU (British thermal unit) propane burners sit inside a cylindrical double-walled cooking chamber which allow the generated infrared heat to cook meat evenly and keep it moist inside and crispy on the outside. Some users have struggled when cooking larger turkeys and may either flip the bird or cut it partway through cooking to ensure the middle of the bird cooks to the minimum safe internal temperature of 165°F. This does not require any oil which makes a safer and healthier alternative to cooking meat with added fat. This fryer can take up to 16lb turkey and will cook this or chicken in around 8 to ten minutes per lb. Other meats will take longer. It comes with a meat thermometer to allow you to check that it has reached a safe internal temperature. 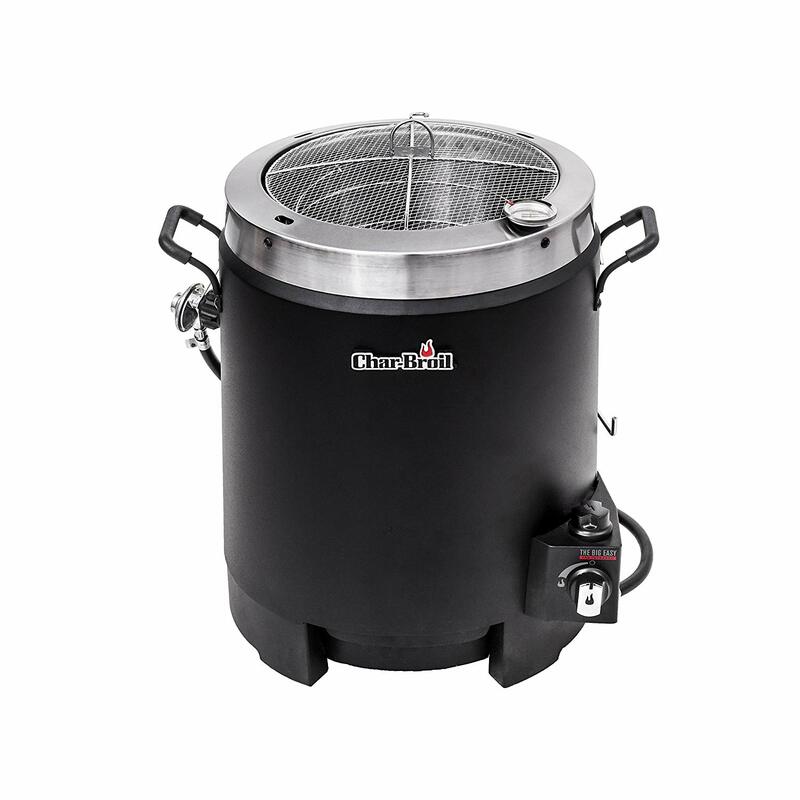 The Masterbuilt Butterball XL electric turkey fryer cooks up to a 20lb turkey. This is safety certified for indoor cooking and has a porcelain coated inner pot to keep the oil inside. It also uses up to a third less oil than similar fryers and can also be used to steam, boil and fry foods. Like any oil fryer, clean up after use can be time consuming and messy. The oil needs heating to 375°F for peanut oil, which can take up to an hour and once the oil is at the correct temperature and the turkey is added, it then takes time for the temperature to return to the correct cooking temperature. This comes with a three month limited warranty. You can also buy additional accessories, marinades and spices from the manufacturer. 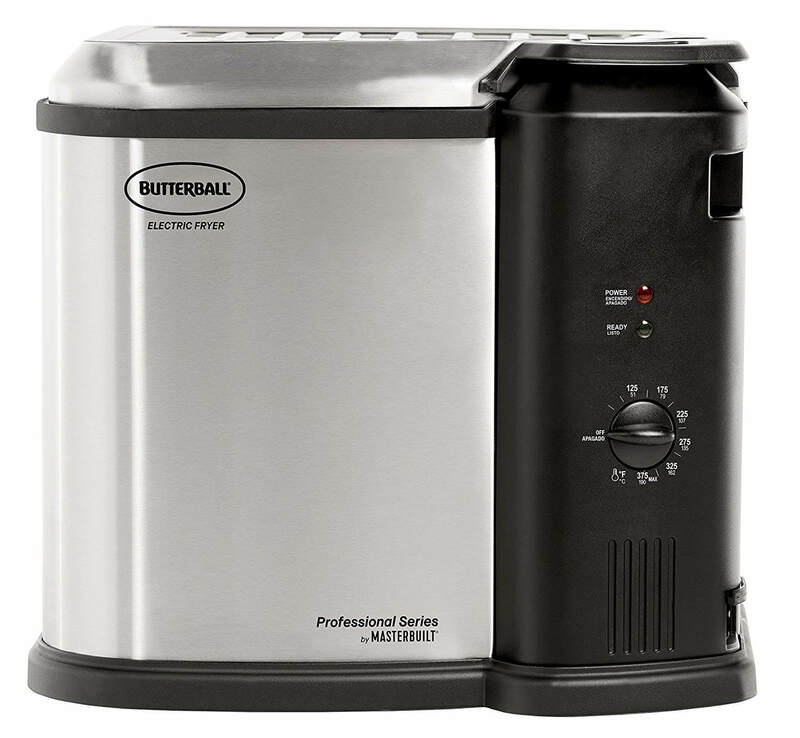 The Masterbuilt Butterball electric oil free turkey roaster and fryer is a double-walled radiant heat outdoor cooker with a tempered glass lid that allows you to monitor your cooking. If wood chips are added to included wood chip box it can also be used as a smoker. Like any large fryer or cooker, it can be worth doing a test cook before Thanksgiving as cooking times will vary, especially if you have been used to an oil fryer. When the roaster arrives, do check the parcel carefully as some users received it without the hardware to assemble it properly. This roaster will take up to an 18lb turkey. The Masterbuilt XXL electric fryer (cinnamon) is suitable for cooking up to a 22lb turkey and can be used for steaming or boiling foods. It has a built-in drain valve and dishwasher safe components. This model has a stainless steel outer and a digital control panel with a timer function. Like other fryers this has a magnetic power cable as a safety feature, but the slightest knock to the fryer when using can cause the cable to disconnect - affecting cooking - so the fryer does need very gentle handling when in use. This fryer is intended for indoor use, it uses up to 33% less oil than traditional fryers and has been tested up to commercial standards. Some users report trouble with raising the temperature of the oil back up once the turkey has been added, so you may want to monitor temperature closely to ensure adequate cooking time at the correct temperature. 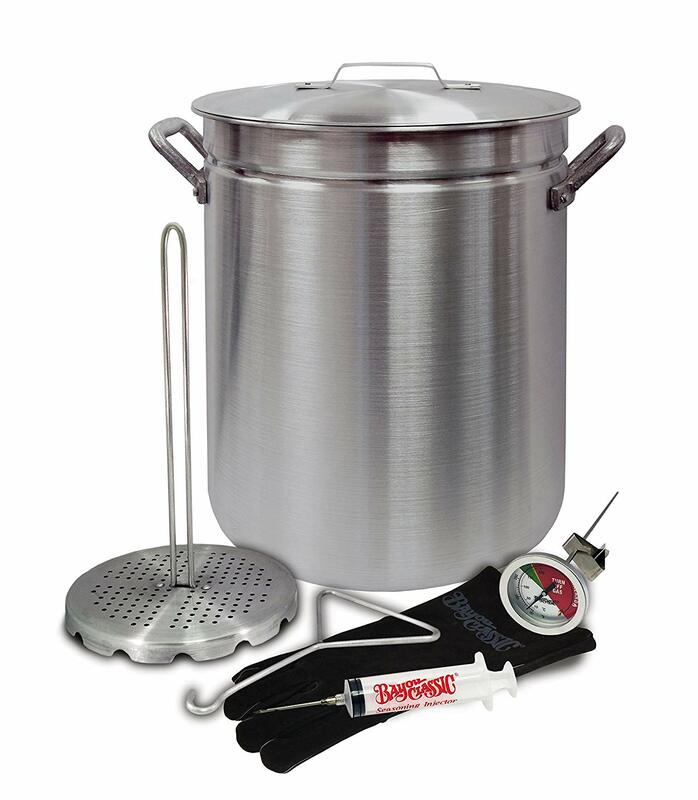 The Bayou Classics turkey fryer pot is a 32 quart stockpot that can fry a whole large turkey in less than 45 minutes. Made from commercial grade aluminum, it is CSA approved, lightweight and comes with a stainless steel 12″ thermometer and poultry rack. 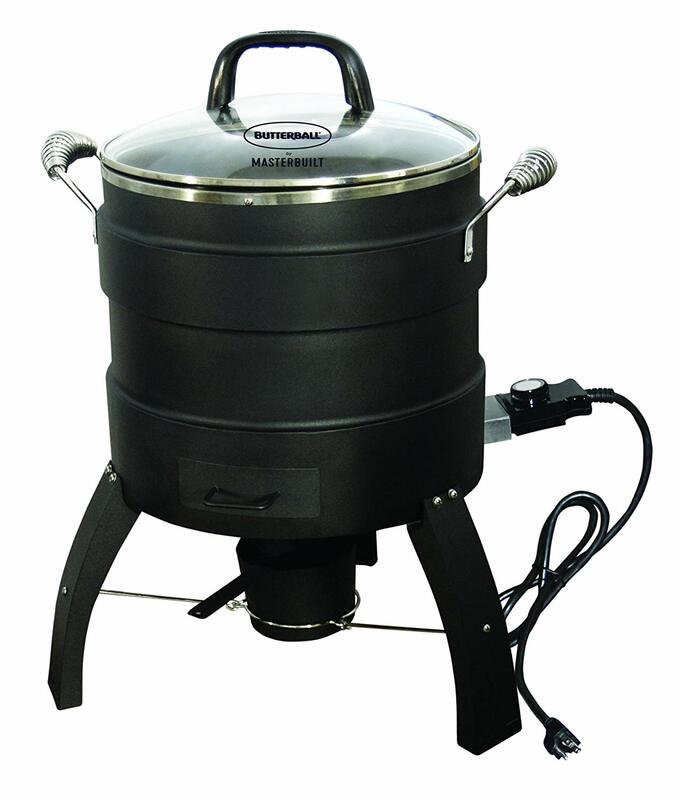 To use this fryer pot, you will need a suitable outdoor propane burner. As this is aluminum it is not as robust as stainless steel so does need careful handling. Although it has handles you may want to avoid carrying it around when full as the base of the pan may be thinner than similar pots. It comes with a lid. The Eastman Outdoors 37069 cooking set has a 65,000 BTU burner and a 30 quart heavy duty stainless steel stockpot. It is suitable for frying turkeys and other foods; an 18lb turkey should fit comfortably in this pot. It comes with various accessories such as a poultry stand, lift hook and a 12″ thermometer but will need connecting to a standard 20lb propane tank. This is a very hot cooking set, so you will need to monitor it carefully to ensure that the oil does not overheat. It is tested to the Canadian Standards Authority (CSA) standards and is certified. Suitable for cooking a turkey up to 14lb, this can also be used for boiling or as a steamer. Some of the components are dishwasher safe and it has a drain valve to make cleaning easier. It has basket drain clips and thermostat controls for safety. This in an indoor electric fryer with a stainless steel outer. Although it is suitable for birds up to 14lb, some users report they have struggled fitting slightly smaller birds into the frying basket. When buying a new turkey fryer, you may find it useful to buy it well in advance of when it is needed so that you have time to do some test cooks. Not only does this mean you become familiar with how it works, but more importantly, how it cooks. This can help reduce the risk of plugging the fryer in on Thanksgiving and finding it is not working properly which means you must then turn the oven on to try and salvage the turkey for a late night dinner. Wearing safety gear such as heatproof gloves and suitable footwear is a must, even for indoor fryers and a turkey fryer or cooker should never be left unattended. It is also sensible to keep a fire extinguisher rated for flammable liquids to hand. Peanut oil is favored for use in turkey fryers due to its high flash point which makes it less likely to catch fire. It also has a higher smoking point which gives a good flavor and it can be re-used a few times before it needs disposing of, which is good as it is more expensive than other types of oil. Peanut oil is also cholesterol-free. You can deep fry turkey in any cooking oil that has a smoke point above 425°F. Corn oil is above this, but canola oil only has a smoke point of 400°F so it unsuitable. The oil should stay at 350°F for efficient cooking. If your fryer does not come with a thermometer, or it does, but you would like extra reassurance, then a deep fat clip on oil thermometer is a sensible investment, as well as a good quality and long probed meat thermometer. The amount of oil needed in the fryer will vary, but as a rule of thumb, a 9lb bird will need between 3 to 4 gallons of oil, a 14lb bird around 5 gallons of oil and a 20lb plus up to 6 gallons. As birds get larger it is sensible to think about separating white and dark meat for frying, as there is a risk of burning the outside and leaving the inside of large turkeys undercooked. Turkey must always cook to a safe internal temperature of 165°F to reduce the risk of foodborne illness. If you use a turkey fryer it should be a fresh and dry non-frozen turkey as the USDA recommends that for food safety, frozen turkeys should always be cooked from frozen. You must never fry a frozen turkey as it will explode and cause a fire. Once your turkey has been cooked to a safe internal temperature, and you have enjoyed your dinner, you can divide leftovers into smaller portions and refrigerate or freeze in shallow containers. If you refrigerate cooked turkey, it needs eating within three to four days, or if you freeze it, then it is best enjoyed within two to six months. If you reheat your leftover turkey, then it also needs to reach a safe internal temperature of 165°F before serving. A propane fryer must always be used outdoors and because it is propane powered, it can be positioned away from the house, which will also keep the cooking smell outdoors. It also needs positioning well away from any decking, trees, roofs or other flammables. As an outdoor fryer though, poor weather conditions will affect it. If you have a propane turkey fryer that uses oil, then the propane tank should be upright and as far away from the fryer as possible. You may want to invest in a propane gauge if you do not already have one as a way of making sure you have enough fuel to finish your cooking. If you use an oil-less propane turkey fryer, then you may want to leave the lid off when cooking as the lid can cause the oil to over heat and dry out your meat. If you want a crispy finish, you can cover the fryer for the last 15 minutes or so of cooking. Choosing an electric fryer can remove some of the fear factor that some of us may experience around propane burners! Mainly designed for indoor use, it can be a real advantage if the weather is bad at Thanksgiving, or you do not have suitable outdoor space for cooking. Oil fryers have a thermostat to help keep the temperature stable and an auto shut off function if the oil temperature gets too high. Many also have in-built timer features. Oil fryers often double as boilers and steamers, so you can use them to cook a variety of foods throughout the year. The main disadvantage of oil-less cooking is that it does not give the traditional fried and crispy turkey that many of us love. This can also be an advantage though, especially for those of us who need to cut out some fat in our diet as oil-less cooking needs at the most, a little grease on the bird. The oil-less fryer also allows us to use the drippings for gravy and we can season the meat exactly as we like it. It saves costs on oil and unlike the oil fryer, it does not take long to warm up, although it will often take longer to cook than an oil-based fryer. Some oil-less fryers are also suitable for use indoors. We trust that this review has helped you to weigh up the advantages of indoor or outdoor fryers and decide whether you want to invest in a traditional oil fryer, or one of the newer designs of oil-less cookers, as well as offering some useful tips around the safe use of a turkey fryer. 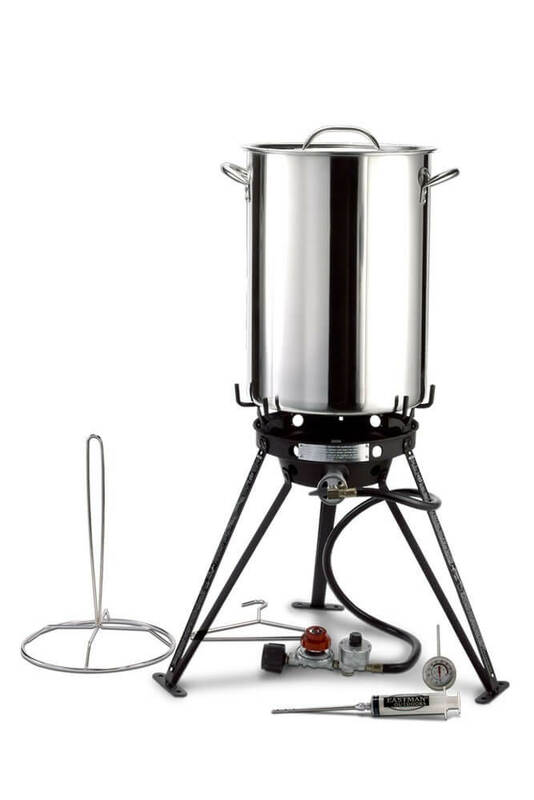 If you are preparing for a large family Thanksgiving, want to fry 8lb of chicken wings for a neighborhood barbeque, or even boil up some lobster or corn on the cob, then using the best turkey fryer is the perfect way to ensure that these and more are cooked properly with minimal fuss and mess.